I have always struggled to find a good smudge free eyeliner, having very oily eyelids everything seems to melt away instantly. 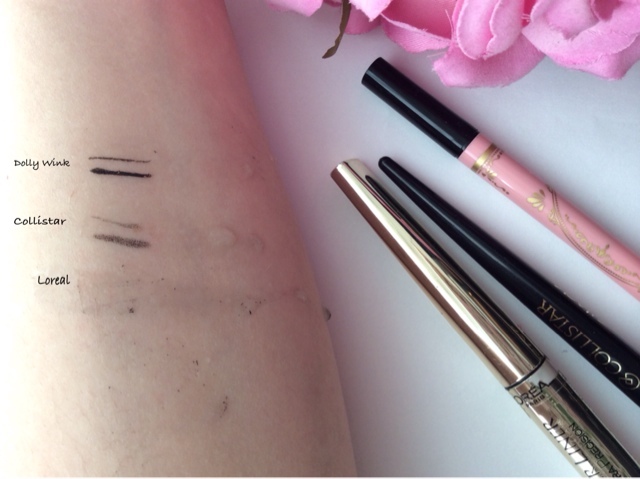 The majority of western eyeliners are not smudge free on my eyes, no matter what I do. A few years ago, around the time when I discovered AB, I started to experiment with different Japanese eyeliners. I don't know how the japanese do it, but most of their liquid eyeliners don't smudge or irritate my eyes. 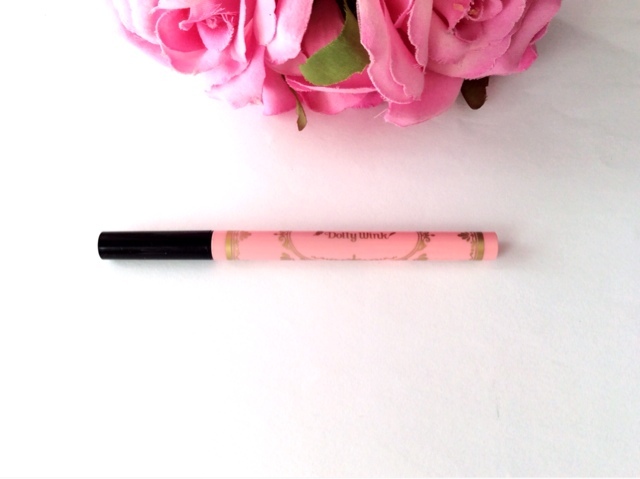 One of my favorite is the Dolly Wink liquid eyeliner. I decided to write a short review and compare it to some western brands. Dolly Wink is a japanese brand produced by the Japanese model Tsubasa Masuwaka. You can recognize Dolly Wink products by their packaging, all of them have a picture of Tsubasa Masuwaka and are cute pink. 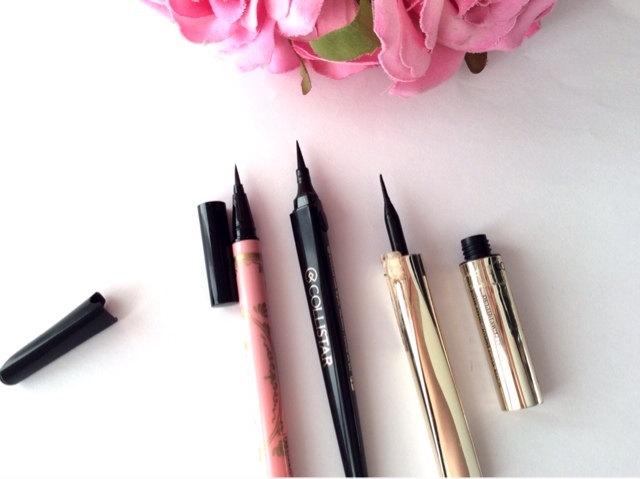 The Dolly Wink Liquid Eyeliner is available in black or brown, I have only tried the black variant so far. I like the cute design, the eyeliner is pink girly with gold letters on it and has a black cap. I don't have the original box anymore, but can tell you that it's pink too with the model picture on it. The design is very girly and cute. 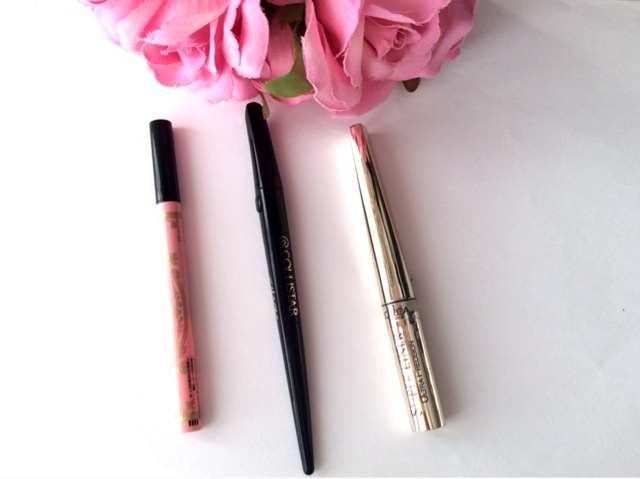 The eyeliner has a soft tip, it's thinner than some famous eyeliners like the one from Clio. The tip is very flexible like a little brush, it makes application much easier and you can control the size of the line with precision. The tip is not too stiff and not too weak, perfect for detailing. 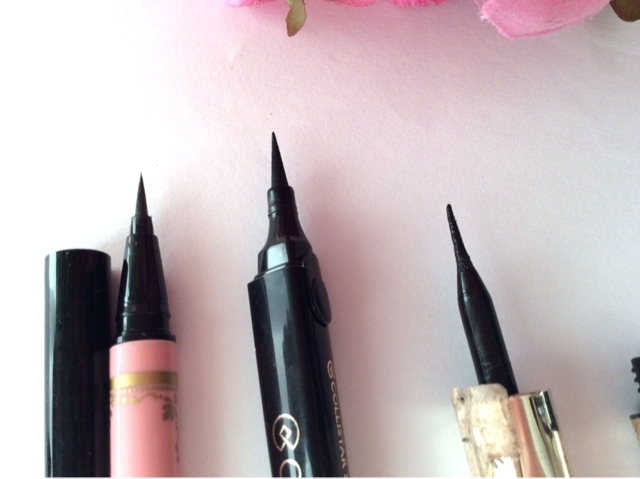 Many eyeliners have a hard tip which makes application difficult, and even painful for me. 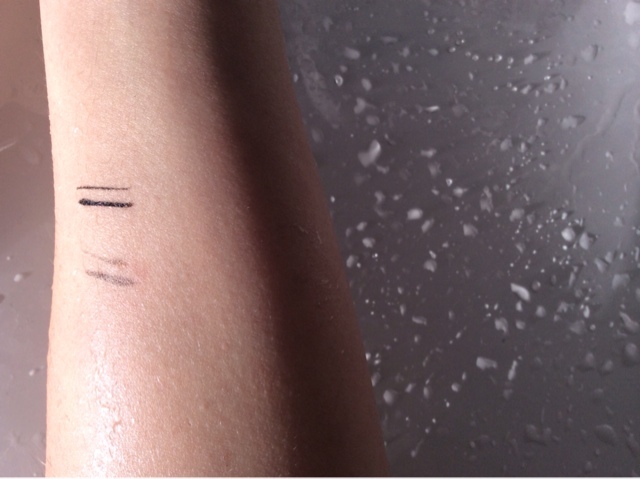 Before using shake it well, then draw a thin or thick line all along the upper lash line. For everyday use I like to draw a 2/3 or 1/2 long line, it looks more natural on me. I have tried different styles with the eyeliner, thick cat style, thin lines etc. It's very easy to control. Pigmentation is quite good, its a black with a satin finish. Now the best part, the staying power is more than just good! it stays the entire day on my eyelids without smudging. Its definitely water resistant, most of japanese eyeliners are. I have been using this eyeliner for over a year now, and honestly I can't go without it anymore. There is no fading at all even after long hours of wear. 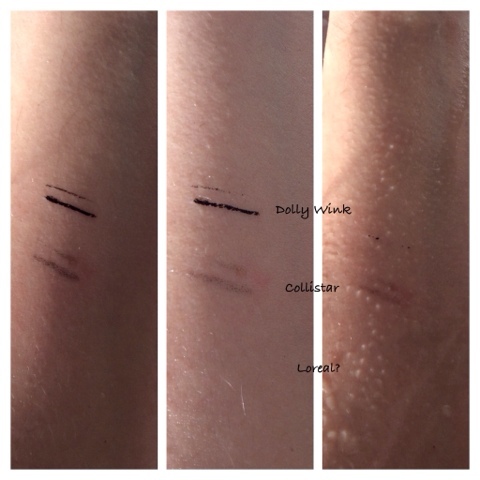 I will compare the performance of the Dolly Wink eyeliner here with two western liquid eyeliners, the Collistar Shock and L'Oreal super liner, but first a short review of them. The Collistar brush is okay, but not very good, its kind of thick and hard, its difficult to draw a line as it pulls on the skin. Does it smudge? yes, but only after a few hours, some of the black color will transfer onto my eyelid in the crease (nothing dramatic). Performance is not bad compared to other eyeliners, but not something I'm looking for in an eyeliner, so Dolly Wink definitely wins here. The L'Oreal super liner is a disaster. Firstly, I hate brushes like that, it makes it almost impossible to draw a fine line. Further, it smudges like hell. After only one hour, the line will be gone and everything will transfer to the crease. Swatches of all tree eyeliners together. Its much easier to draw a straight and fine line with the Dolly Wink eyeliner than with Collistar. Its a struggle with the L'Oreal brush, look how thick the line turned out. Splashing some water and rubbing on it. 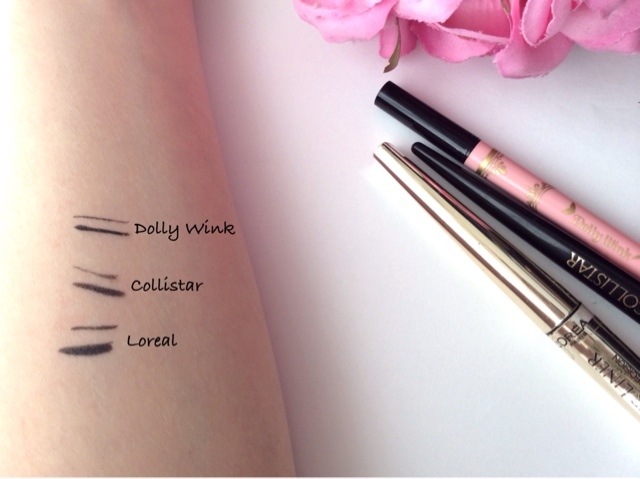 The Dolly Wink swatches don't change at all, Collistar starts to fade away and L'Oreal is entirely gone. Running it under water for 30 seconds. Nothing happens to the Dolly Wink. Using Bioderma cleanser. Again, nothing happens to the Dolly Wink. 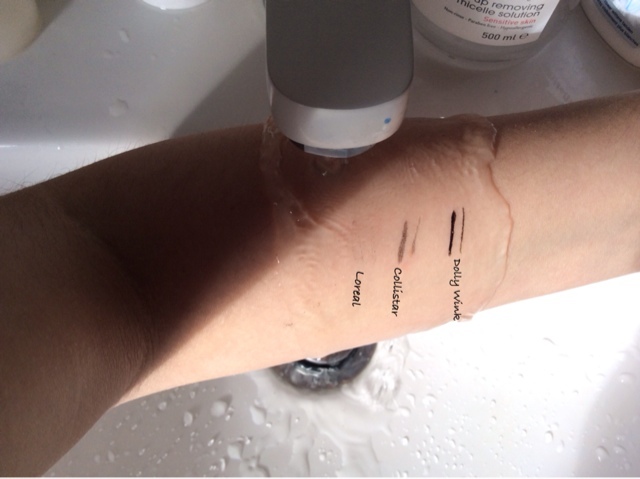 Using Cosrx cleanser. Dolly Wink eyeliner removed after a few attempts. From personal experience and the tests its clear that the Dolly Wink is by far the superior eyeliner. It's smudge free, water resistant, I can wear it for many hours without worrying about color transfer. It's easy to apply and very affordable. I was shocked at how bad the L'Oreal eyeliner performed, you just need two drops of water and gone. Almost all people get sweaty/oily eyelids to some degree, meaning the eyeliner wont survive on anyone, its so crappy. Collistar is okay, but its not very water resistant and the brush is hard. These are only two Western eyeliners, but I have tried many more and they all lie somewhere between the L'Oreal and Collistar. Disclosure: This post contains some affiliate links, shopping with them supports the blog. Nice article! Love the packaging of dolly wink liner. As you rate this dolly wink liner 5 out of 5, surely going to try. Hope results be satisfactory!